Polyolefin is available in semi-rigid, flexible and very flexible and are flame retardant. They offer excellent chemical, physical and electrical properties. Meets UL, CSA and military specifications. 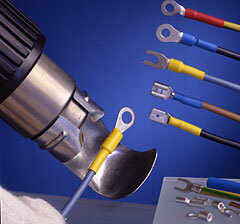 PVC is economical and has a low heat shrink temperature. Also is flame retardant and meets UL, CSA and military specs. Resists most chemicals and oils in addition to sunlight, moisture and fungus. Teflon is available in TFE and FEP and both are excellent in high temperature applications. Excellent chemical and solvent resistance along with outstanding electrical characteristics.